Solanum melongena var. esculentum. Start seed early indoors, mid- to late March, for transplanting outside 8 - 10 weeks later. Space plants 2 - 3 feet apart in rows 2 - 3 feet apart. Eggplants need full sun and loose, deep, rich soil. Classic large oval purple-black eggplants on big, spreading plants. Fine quality and keeps well. Small creamy-white eggplants in the classic teardrop shape. Tender and mild tasting. Plump round white fruits, blushed rosy-purple. Very meaty and mild tasting, this Italian heirloom is one of the best for all your eggplant recipes. Solanum integrifolium. Striking deep red-orange, flattened, ribbed fruit, 1 - 3" across. Pleasantly bitter, used in Asian stir-fry. Highly ornamental plants to 2 - 3 feet tall, with dark purple stems and soft green leaves. 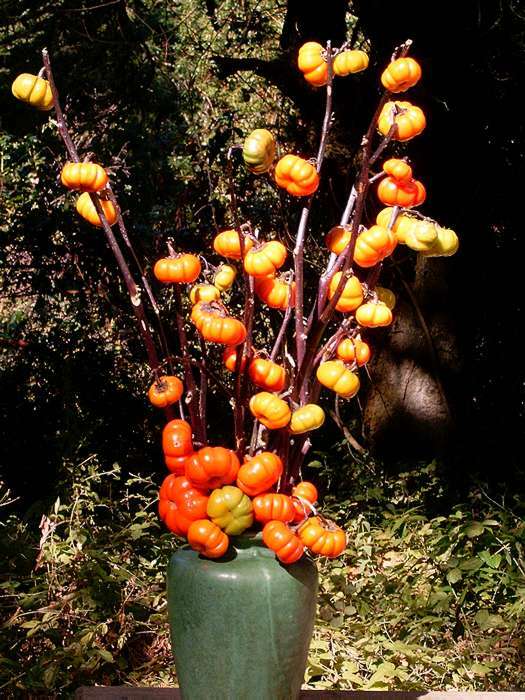 Cut branches of the fruits make long-lasting autumn decorations. Pure white 2 - 3" oval fruit with mild flavor. Heavy yields, does well in short-season areas if started early. Brassica oleracea. 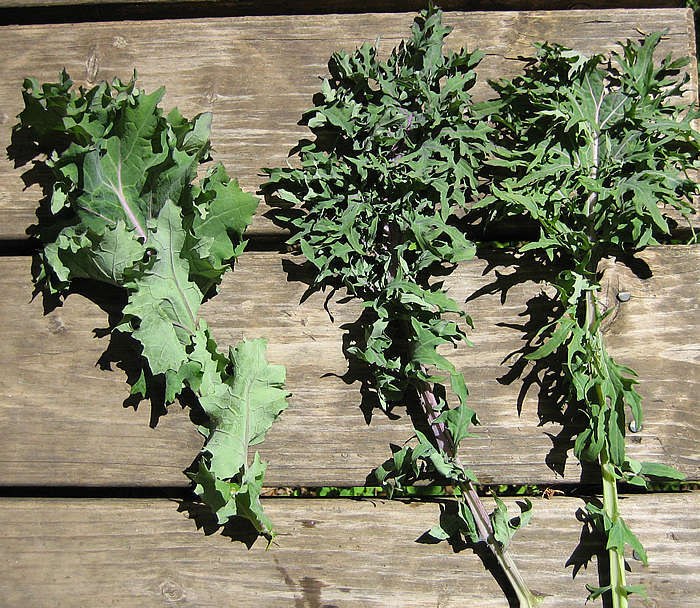 Also known as Borecole, Kale is a cool weather crop, with sweet tender leaves. A good fodder plant for poultry and livestock. In the South, sow in late summer or early fall for winter and spring harvest. In cold climates, sow in late spring for fall harvest. Likes full sun and a rich, well-drained soil. Keep moist. Sow seeds 1/4" deep, thin to 1 1/2 feet apart in rows 1 1/2 - 2 feet apart. Long, narrow, deeply savoyed and curled leaves, dark green above, nearly black beneath. A Tuscan type, tender and flavorful. Good for baby salad greens, mature leaves great baked for chips. Striking lacinato type introduced by Wild Garden in 2016. Classic savoyed narrow leaves are bright blue-green with pink midribs. Tender and flavorful, hardier than other lacinatos. Portuguese variety with big rounded smooth green leaves. Some claim it has the best flavor of any kale. Classic Italian heirloom from Tuscany, with long narrow savoyed dark green leaves. One of the tenderest kales, with mild flavor. Very hardy, tastes even better after frost. Deeply savoyed long narrow leaves overlaid with shades of purple, blue-green, and red. A variety of leaf shapes varying from nearly entire, to very frilly and divided. Very vigorous and cold hardy, perennial in mild climates. Organically grown. A selection from a Massachusetts gardener, who says: "This kale began about 20 years ago as 'asparagus kale' from the Seed Saver's Exchange. Here in my garden it's almost perennial. It's a prolific seeder, and bees love the flowers. The leaves are large and flat, not as round as collards, and some are crinkly." A dinosaur or lacinato type, with long, narrow, heavily savoyed dark green leaves, forming a small tree-like plant. Very tender and tasty. Developed by Frank Morton to grow through summer without flowering, for harvest into winter. Heat tolerant, aphid resistant. Organically grown. Outstanding variety with broad, slightly frilled leaves with red veins and purple stems. Great for salad mixes. Bolting stems from over-wintered plants are sweet and tender—eat like asparagus. Organically grown seed. Outstanding variety with deeply ruffled leaves with purple veins. The whole plant may turn purple in cold weather. Tender and tasty. Grows year-round in mild climates, and may reach 4 feet tall. Brassica oleracea longata. 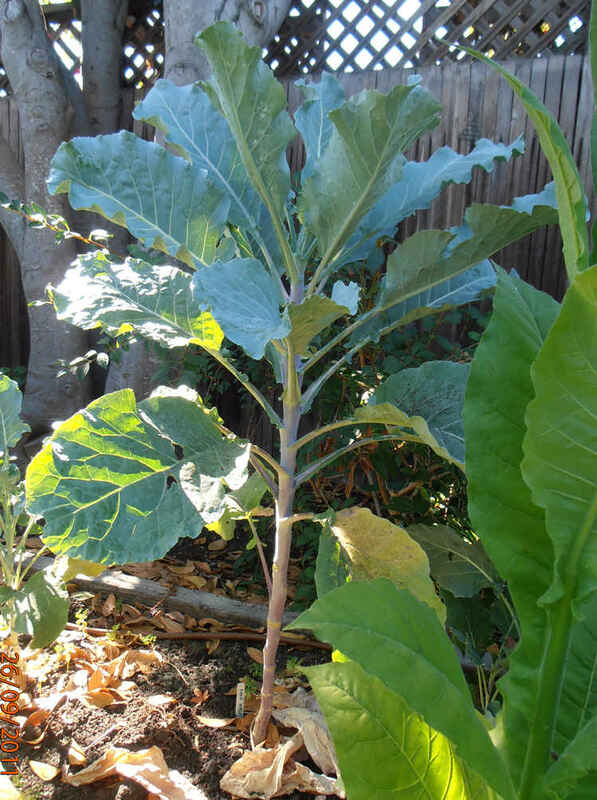 The famous giant kale (or cabbage), reaching 5 - 7 feet the first year, and up to 20 feet the second. The straight thick trunks may be cut and polished to make handsome walking sticks, and the leaves may be harvested for years. Striking and unusual. Deeply ruffled dusky green leaves with white veins and mid-ribs. Stands wet soil, vigorous and productive. Nice in salads and braising mixes. In 1995 Garden City Seeds in Montana judged this to be the most cold-hardy and best tasting kale. Organically grown seed. Brassica oleracea var. Caulo-rapa. A member of the cabbage family, the stem forms a ball-shaped bulb which is eaten. It is a delicious vegetable combining the best qualities of turnip and cabbage when cooked, and is mild, sweet and crisp eaten raw. Sow in early spring or late summer, spacing plants 6 - 8" apart in rows 1 1/2 feet apart. Prefers cool weather and light, rich soil. Best young and tender. 60 days. An old-fashioned, pre 1885 variety with purple skin and leaves. Flesh white and tender, sweet and mild flavor cooked or raw. Allium ampeloprasum var. porrum. Leeks are a popular vegetable in Europe and the Mid-East, where their mild, sweet, onion-like flavor is valued in stews, pies, casseroles and soups. They are hardy plants and may be sown in spring for harvest during fall, winter, or through to the following spring. Sow seed in early spring in rows 1 foot apart, thinning to 4" apart in the row. When plants are nearly mature, draw soil around the stalks to blanch. Classic home-garden variety with tall blue-green leaves and thick, white stalks. Cold hardy, for fall and winter harvest. Mild oniony flavor, delicious roasted or grilled ,with olive oil, or in soups, etc. Big vigorous leeks with pleasant mild flavor. Very cold hardy Scottish heirloom, introduced to gardeners in the early 1800s. Lactuca sativa. Sow in rows 1 foot apart as early as the ground can be worked, not covering the seed, as light is needed for germination. Thin to 8" apart as they develop. Or, plant in flats 1 month before planting out. Transplant carefully. Lettuce prefers cool to moderate temperatures, and is best sown in spring or early fall in a light, well-drained soil. Give shade in hot weather. For a continual crop, sow every few weeks, as long as desired. There are four basic types of lettuce: Loose-Leaf, Butterhead, Crisphead, and Cos or Romaine. Within these types there are also: Winter Lettuces, which are more adapted to cold and will withstand ordinary winters with little care. Spring Lettuces head rapidly and are sown just after winter. Summer Lettuces are usually larger and do not run to seed as fast in hot weather. Unusual triangular green leaves in thick, loose heads. Hardy and productive. Very flavorful. Deep red cos-like leaves in loose heads, with a tender, buttery texture. Developed by Shoulder to Shoulder Farm from a chance volunteer: "This is a new and variable strain, but was plenty uniform enough to be our favorite picker..." Organically grown. Brilliant green oakleaf, with almost a butter-lettuce head of sweet tender leaves. Very nice texture and flavor, can be used for salad at any size. Vivid deep purple-red leaves, strongly savoyed, semi-cos, with nice tender crumpled hearts. Remarkable summer color, cold-hardy into autumn. One of the most dramatic red lettuces from Wild Garden selections. Organically grown. Romaine type from Israel, with crisp, tall, bright green heaves. Slow bolting, heat tolerant yet does well in cool weather. Compact heads of deeply curled, frilled leaves, with an intense dark burgundy color. One of the darkest of this type. Slow bolting for a long harvest. Good color and texture for salad mixes. Deep purple-red oak-leaf type, forming a large rosette of thick, curly leaves. Stays red even in hot weather. Bolt resistant and non-bitter. Heat and cold tolerant, an excellent cutting lettuce for mesclun. "Mascara lettuce is outstanding: 16" across and still tender!"—K. Kennedy, California, 1/97. Upright romaine type, with green ruffled leaves with dark red spots. Sweet, juicy, and crunchy, with rose-pink hearts. Another nice one from Frank Morton. Organically grown. Thick rosettes of deeply-lobed medium-green leaves that stay sweet and tender, with no bitterness. Very heat-resistant, for long-lasting harvest throughout summer. An old favorite, with good reason. Another wonderful cross by Wild Garden Seed, this one has deep red outer leaves and a buttery yellow interior, with blushed rose center. Crisp outside, tender inside. Organically grown. Deep, dark, red-purple rumpled leaves, one of the darkest red lettuces available. Crisp and crunchy. From the Seed Saver's Exchange. Romaine type with wine-red leaves with a buttery texture and sweet flavor. Heat and cold tolerant, fast growing. Good for baby leaf mixes. Deep green romaine type, forming tight heads with a crisp, crunchy texture. Stands heat, Excellent for baby leaf production. The most diverse lettuce mix ever! From the premier lettuce growers at Wild Garden Seeds, this mix contains every variety they have, plus unreleased works-in-progress. Loose leaf, butter, crisp head, romaine—red, purple, green, bronze, speckled—frilly, round, narrow, wide. Amazing diversity for your salads! Organically grown. Cucumis melo. A group of annual melons that includes the heavily scented netted varieties known as cantaloupes, as well as the smooth-skinned melons such as crenshaw, casaba and honeydew. Muskmelons need full sun and soil rich in organic matter. Plenty of water gives the best results. Sow seed when the weather has warmed, in hills spaced 4 - 6 feet apart each way. Plant 5 - 8 seeds per hill, thinning to the 3 or 4 best plants. Best sown direct to the garden, as they dislike transplanting. Wet soil prevents germination. Large round mild-flavored muskmelon, originally from the Altai region of the Soviet Union. Very early, good for northern gardens. Heirloom French melon with smooth golden yellow skin. Flesh pale green, with delicious sweet pineapple-honeydew flavor. Stores for weeks. A Ukrainian heirloom, with round, smooth 10" melons. Dark rind turns orange-yellow when ripe. Extremely sweet creamy-white flesh. Keeps well. Very rare, nearly extinct French heirloom from the 1800s. 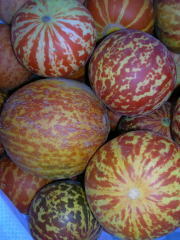 Deeply ribbed melons with orange and white mottled skin, sweet orange flesh. Another fine variety brought back by the Seed Savers Exchange. One of the best O.P. (open pollinated) home garden cantaloupes. Round, well-netted 4 - 5 pound melons with deep orange flesh. Sweet, juicy and high quality. Softball-sized melons have deliciously sweet golden flesh. Extremely early, can even produce two crops. Developed by the University of Minnesota in 1948. Compact plants can be grown in containers. Good for northern areas or small gardens. Deeply ribbed oval melons with smooth yellow skin and deep orange flesh. Tolerates heat and little water, stores well if not bruised. Heirloom from the Navajo Nation. Heirloom French cantaloupe, with slightly flattened, ribbed smooth melons. Very dark green skin, nearly black, turning orange when ripe. Dark orange flesh, very fragrant and sweet. Small size, 2 - 3 1/2 pounds. One of the finest early French melons, once popular, now very hard to find. Cucumis melo. Small smooth melons to 1 pound. Beautiful golden skin with bright red-orange tiger stripes. Highly fragrant white flesh, meltingly sweet cantaloupe flavor. Armenian heirloom, does well in dry climates. A real winner for farmer's market sales. Large 8 - 10 pound melons with smooth skin and crisp, spicy, white to rose pink flesh. Stores well. Crenshaws are said to be one of the sweetest in the melon family, created by crossing Casabas with Persian melons. "The law, in its majestic equality, forbids the rich as well as the poor to sleep under bridges, to beg in the streets, and to steal bread."—A. France. Brassica juncea var. integrifolia. Mustard leaves are excellent greens with a sharp pungent flavor. Boiled like spinach, they become tender and not at all bitter. Very good in soups, or as simple cooked greens served with a little melted butter. Plant in late spring or early summer, or in frost-free climates, sow in fall and early winter. Prefers a rich soil and abundant moisture for fast growth, but will produce well in any soil. Thin to 6" apart in rows 18" apart. A cool weather crop. Fast growing, with wide, dark green leaves and creamy white midribs. Vigorous and heat tolerant, popular in the South. New selection from Wild Garden, a cross of horned types with sweet and colorful miike types. Bright green leaves with vivid purple veins and wide midribs that thicken and produce 'horns' at maturity. Good young in salads, or stir-fry older leaves. Flavor is sweet, not overly hot. Organic. Ruffled leaves are deep purple on top, contrasting with the green undersides. Young leaves are a wonderful salad green; excellent peppery cooked greens at any age. A particularly pretty variety with a lot of flavor. Organically grown by Shoulder to Shoulder Farm. Airy, narrow, deeply-cut leaves, strikingly colored burgundy-red and bright green. Peppery-sweet taste, perfect for salads and baby leaf mixes. A pretty container plant paired with calendulas, snapdragons, and nasturtiums. Stands heat, slow bolting. Smooth leaves blushed deep purple, with a spicy flavor. Grows vigorously in cool weather. A fine addition to salads. Organically grown. Large upright plants with broad bright green leaves, lightly crumpled and frilled. Slow to bolt, cold hardy, sow in spring or fall. Compact rosettes of small spoon-shaped dark green leaves. Amazingly tender and mild flavored. Good in salads or lightly cooked. Sow in late spring through fall. Leaves crumpled and savoyed. Large bright green ruffled leaves like a loose head of lettuce. Sweet flavor and crisp texture. Good in salads or sautéed with ginger and soy Sauce. Makes good microgreens. Another hugely diverse mix from Wild Garden, containing all their current mustards, plus unreleased breeding experiments. Green, purple, golden, striped—whole, lacy, ruffled, smooth, savoyed. All deliciously hot and spicy! Fantastic for baby salad mixes. Organically grown. Hibiscus esculentus. A member of the Hibiscus family, Okra is a lovely annual with large yellow flowers followed by softly downy, ridged pods. These pods are delicious in spicy stews and soups, and even older pods are very good sliced thin and fried in butter till golden brown. Young pods good raw. The ripe seeds have been roasted as a coffee substitute. Sow when weather has warmed, in a rich, somewhat sandy soil. Space 1 - 2 feet apart. 55 days. All-America Silver Medal winner. Bears a large crop of rich green, flavorful pods till frost. Easily grown, requiring little more than water. Short plants to 2 - 4 feet, bearing pointed 7" green pods, tender and tasty when young. Early and prolific. Thick meaty pods are a deep red-orange, making for very pretty plants. Highly productive and tolerates hot dry conditions. Beautiful 4 - 5 foot plants have deep wine-red pods and stems, green leaves, and large butter-yellow flowers. Tender 6 - 8" pods turn green when cooked. Nice enough for the flower-garden! Allium cepa. Cultivated for thousands of years, onions are eaten worldwide. There are two main groups; those grown for the large yellow, red or white bulbs, and those grown for their slender green leaves, the 'scallions' of commerce, and generally known as 'bunching onions'. Sow onion seed as early as soil can be worked, thinning to 4" apart for bulb onions, or 8" apart for bunching types. Light, loamy soil will produce the best crops. Onions like lots of compost or fertilizer. They can be harvested young, or left till the tops are dry, when they can be pulled up and stored in braids or with the stems broken off. Allium fistulosum. A perennial bunching onion for green onions. Slender stalks of dark green leaves and white bases. Does not form bulbs, but divides to produce new shoots throughout the season. Very hardy, will grow over winter in most areas if given some protection from heavy freezing. Highly productive, first cutting in 3 months. Easy from seed. Early mini-onion with glossy rich purple golf-ball sized bulbs, or can be harvested young for bunching onions. Turns a pretty rose-pink when cooked. Short-day type, good in the North. Heirloom bunching onion from Tokyo, known for its sweet and mild flavor, Tall slender green tops can reach 20 - 30". Best in mild climates, won't tolerate extreme heat or cold. Petroselinum crispum. A favorite herb that adds flavor and vitamins to any dish. Use fresh or dried. Turnip parsley has large, edible roots which can be dug and stored through the winter. Parsley seed is often slow to germinate. It likes a rich, moist soil, and will become perennial in mild climates. In cold winter climates, grow indoors or mulch heavily to protect from frost. 75 days. Also known as Italian Parsley, this type is the best for drying and for soups. It has flat, wide green leaves on a vigorous and spreading plant. Will form large clumps under favorable conditions. Stronger flavor than the curled leaf types, and retains more taste when dried. A moss curled variety to 1 foot, with finely-cut and well-curled leaves. Best flavor of the curled types. Takes hot dry conditions without fading. Adds flavor and texture to salad mixes. Traditional flat-leaf type, selected for over 20 years for cold hardiness and disease resistance. Full flavored dark green leaves. Survives cold weather and poor conditions. The best parsley for difficult garden areas. Organically grown. Petroselinum crispum var. tuberosum. This type is grown for it roots, which resemble a small parsnip or turnip. They have a delicate parsley or celeriac flavor, making a delicious addition to stews and soups. The leaves may be used like regular parsley, and the roots may be stored over winter. A deep soil is best for good roots. Sow in early spring for a September harvest. Should be grown more. 90 days. Thick white roots, 8 - 10" long and 2" thick, nicely tapered. Delicate parsley flavor. Vigorous grower with large, well-flavored tops. Pisum sativum. Peas are a cool weather crop, and like humidity. Sow early in spring in rows 1 foot apart for dwarf varieties, 3 feet for tall varieties. Plant seeds 1 - 2" deep. Thin to 4 - 6" apart. Stake tall varieties when about 6" high. For succession, sow at intervals of 1 - 2 weeks till midsummer. In the South, sow in fall for winter harvest. Peas are classed as smooth or wrinkle seeded. The smooth types are best for drying, freezing or canning, wrinkled types are sweeter and best for eating fresh. Edible podded peas, such as Snow Peas or Sugar Peas, have tender, sweet pods which are eaten when the peas inside are still very young and small. 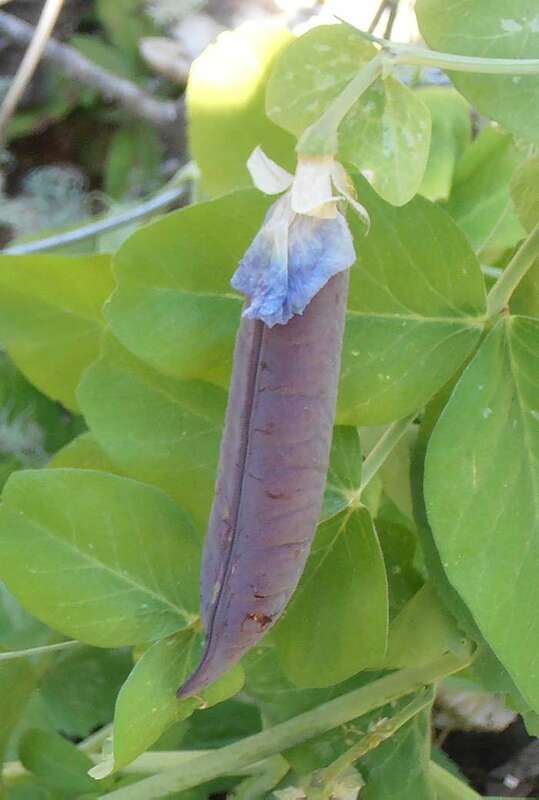 Heirloom Dutch pea, called Blauwschokkers, or Pois A Cross Violette in France. Enjoyed in Europe for centuries. Sweet-scented bi-colored flowers followed by striking blue-violet pods. Young pods are sweet and delicious, or dry mature peas for soup. Flat light-green 3" pods are great for stir-fry. Early and prolific bushy plants with purple flowers. The classic edible-pod pea, introduced in 1892. Bright lemon-yellow pods on 6 foot tall plants, with lovely two-toned purple flowers. Best when eaten small. Originally obtained from a market in India. Very nice. An amazingly productive English variety, with slender pods containing 8 - 11 small peas. Vines grow to 28" tall, usually setting double pods held at the top for easy picking. Peas are very sweet, great for eating fresh or lightly cooked. Capsicum species. Peppers need a long warm season and very rich soil to produce large fruits. Sow seed indoors in early spring, transplant outside about mid May. Space 1 1/2 feet apart in rows 3 feet apart. 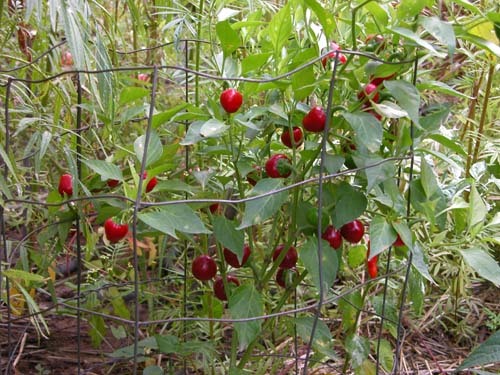 Many peppers are perennial in mild winter areas. Both sweet and hot peppers turn red at maturity, but can be eaten either green or red. They contain high amounts of Vitamin C, particularly when red. The leaves are also edible and used in cooking. A popular crop. Small round peppers with thick meaty flesh and sweet delicious flavor. Ripens from creamy white to red, very productive. One of the best for drying and powdering, also excellent fresh. Classic big blocky bell peppers, thick and crisp, with mild flavor. Good for stuffing, roasting, grilling, or fresh eating. Deep green to red. Sweet crunchy mini-bell peppers, deep red-brown when ripe. Compact plants covered with 2" fruits, perfect in containers. Heirloom from Lucina Cress of Ohio, who used to sell them pickled for church fundraisers. Great for farmer's market sales. Thick tapered 4 - 5" fruits, extremely sweet and flavorful. Delicious fresh, and makes some of the finest paprika powder when dried. Ripens from creamy white to deep orange. Large sweet bell peppers, changing from green to gold to deep orange. Ripens to a glowing orange, with a mild sweet flavor. Blocky thick crunchy peppers, perfect for roasting and grilling. Classic sweet pimento pepper, With very thick meaty flesh. Heart-shaped red fruits. Stands heat and humidity, good in the South. Excellent fresh, dried, canned, or pickled. Traditionally grown in the Navarra region of northern Spain, these small tapered sweet red peppers are usually roasted over wood fires to add a smoky flavor. Often stuffed with cheese or meat. The name means 'little beak'. Medium sized sweet bell pepper, which ripens a deep purple. Mild sweet flavor and compact plants. Tapered 6 - 8" light green peppers, changing to scarlet at maturity. Mildly hot, excellent for stuffing, canning or frying. An old favorite. Striking plants with variegated green, white, and purple leaves, and deep purple stems. Small conical peppers ripen green to purple to red, very hot. Named for the famous gardens in Alabama. Shiny black peppers ripening red. Pretty plants with purple-veined leaves and purple flowers. Medium hot, nice for salsa. Small, colorful upright peppers start deep purple and ripen to orange then red. Compact plants with purple stems and purple-blushed leaves. Very hot, great for salsa. Good in containers. Striking African-American heirloom, with white and green striped foliage on spreading plants to 2 feet tall. Hanging fruits are green with cream stripes, ripening through orange with brown stripes, and finally to all red. Medium hot, used for shellfish cooking around Chesapeake Bay. Makes great salsa, and the plants are very ornamental. Small rounded peppers ripen golden yellow. Variable heat, from mild to very hot. Pretty plants variegated with purple, striking with the yellow fruit! Good fresh or dried, and makes great salsa. Beautiful deep mahogany-red peppers in the classic Habanero shape and heat. Mildly hot 7" long and 2" wide tapering peppers. Ripens from green to light yellow to red. One of the best hot peppers for cool climates; has matured in Nova Scotia in a sheltered location. A long-time favorite, colorful and not too hot. Rare variety of Jalapeño with bright orange fruits, a little longer and more tapered than the green type, but just as hot. Large colorful variety, turns dark purple and finally deep red. Full Jalapeno flavor and heat. Makes pretty purple pickled peppers! Also called Naga Jolokia, Bhut Jolokia, and Ghost Chili. These peppers from India hold the Guinness Book of World's Records world's hottest pepper. Tapering 3" orange-red, rough-skinned peppers. Apparently a cross between Capsicum chinense and C. frutescens. Eat these fresh or dried when you want an extreme experience! Slender upright peppers, dark purple turning red. Very hot! Compact pretty plants with purple stems and purple-blushed leaves. Good in pots. Wide, tapered 6" peppers, dark green to red to red-black. Medium-hot, the classic pepper for chiles rellenos (stuffed peppers). Use fresh or dried. Famous small peppers from northern Spain. They start out mild when young, and turn very hot when red. Plants are 4 feet high and 3 feet wide, giving 50 - 100 peppers per plant. Does well in the North. Long, wrinkled, thin-skinned peppers. Slightly hot, the classic type for pickling. Amazingly pretty—the whole plant is purple, but the undersides of the leaves are green with purple veins. Bright purple flowers. Small upright peppers are black-violet turning red, quite hot. One of the blackest peppers, and makes a beautiful sight when the peppers turn red against the purple foliage. Compact grower to 2 feet tall. Small round cherry pepper with a good amount of heat, though said to lose about half its heat when cooked. Also called Baccio di Satana, Ciliegia Picante, and Picante Calabrese. Very small hot peppers grow up-turned and are bright red when mature. A long-lived perennial in the cool Oaxacan mountains, but needs more warmth than Manzano to really thrive. Extremely hot. Name pronounced 'she-GO-lay'. Also called 'Soltero' (bachelor), a humorous allusion to the shape and upright habit of the fruits. "I grew this for several years and it provided all my hot pepper needs with plenty to give away. I liked it because I could carry over a plant or two in a sunny window. It carried on until Christmas and started blooming again as soon as I moved them outside for the summer. They bore like this for 2 - 3 years. Also it was the hottest pepper I've ever grown, including Habanero and Serrano."—B. T., North Carolina,1/98. Cucurbita pepo. Large vines whose fruits, small or large, are delicious, and are made into pies, stuffed, baked like winter squash, or pureed for soup. Carved and decorated, they play an important role in our yearly Halloween celebrations. The seeds are rich in oil and protein, and are excellent eaten whole, after roasting in salt and oil. Plant seeds in rich, well-manured soil when all danger of frost is past and ground has warmed, in hills 6 feet apart. Place 5 - 10 seeds per hill, and cover lightly with soil. Thin to 3 or 4 of the strongest plants in each hill. They are vigorous and rampant growers that like abundant moisture, and need plenty of room to spread. Wet soil prevents germination. 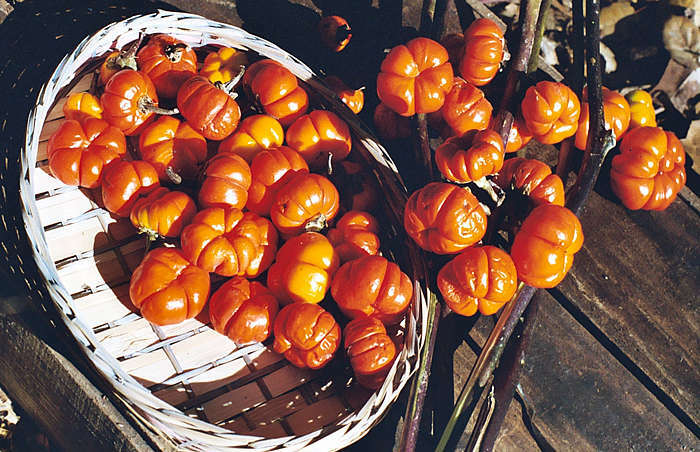 Luminous white, medium-sized pumpkins with very sweet dark orange flesh. White pumpkins generally have a higher sugar content, better for pies. The smooth white skin is great for painting Jack-O-Lanterns. Great for both eating and decoration. For giant pumpkins, try these—40 - 60 pounders are common, and with careful pruning and fertilizing you can get 100 pound pumpkins. Lovely smooth golden-orange skin, orange flesh. Heirloom from the south of France. Large beautiful pumpkins to 20 pounds, ribbed and slightly flattened. Tan skin, dense firm orange flesh with delicious flavor—sometimes sliced thinly and served raw. Superb cooking pumpkin and stores well. Cucurbita maxima. An Heirloom French variety, with striking shiny bright red-orange skin. Round, flat shape with deep ribs and indented stem, thick yellow-orange flesh. To 15 - 20 pounds. Mild flavor, keeps well if carefully cured. The glowing red color and unusual shape are very appealing. Long-time favorite for eating. Small, orange, slightly flattened 6 - 8" pumpkins, with thick, sweet, orange-yellow flesh. Keeps well, one of the best tasting and widely adapted. Cucurbita pepo. Small orange pumpkins, perfectly round, with elegant pale netting. Very sweet velvety-smooth flesh makes this one of the finest pie pumpkins. Introduced in 1893, this beauty has been a favorite for over a century. Huge French heirloom pumpkin, usually about 25 pounds, but can reach over 100 pounds. Dusky orange skin, sweet yellow flesh. Slightly ribbed and flattened. Superb flavor, popular in France for baking or soups. Stores well. Raphanus sativus. Crisp roots with a hot spicy flavor, radishes are one of the easiest vegetables to grow. The sprouted seeds can be added to salads or sandwiches for a wonderful, mildly hot flavor. Sow seed as early as ground can be worked in spring, and successively till mid-summer, and again in early fall. Oriental radishes may be sown at any time as they do not have the tendency to become pithy in hot weather like other radishes. Plant 1/2 - 1" deep in any good soil. Space rows 1 foot apart; thin to 2" apart as soon as seedlings appear. Keep soil moist for best results. Rose-pink oblong 6" roots, wider at the tip. Crisp and a good keeper. A Chinese winter variety, for spring or fall sowing. Said to have been brought to Europe from China by Jesuit missionaries. Pre-1850. "The China Rose radishes are really interesting—they take much longer to reach the eating stage, but the plants grow much bigger, the bulbs are much bigger, and don't seem to get woody when so big, and a good keeper. "—Eugenie Fellows, Florida, 1/96. Long slender rose-red radishes with crisp white flesh. To 6" long. Heirloom from the 1880s. Raphanus caudatus. Grown for the slim, deep-purple seedpods, which reach 8 - 16" long. Pods produced abundantly. Likes heat and bears all summer. From Southeast Asia, the pods have a very pungent radish flavor, eaten raw, pickled or cooked. A popular garden vegetable in the U.S. in the 1860s, now rarely seen. No edible roots, only grown for pods. Huge round radishes from Germany, can reach baseball size but never spongy. Cherry red outside, pure white inside, mild flavor. Unique radishes with pale yellow skin and white flesh and good flavor. The unusual color is outstanding for farmer's market sales. Fast growing leaf radish grown for the spicy, crunchy young sprouts. 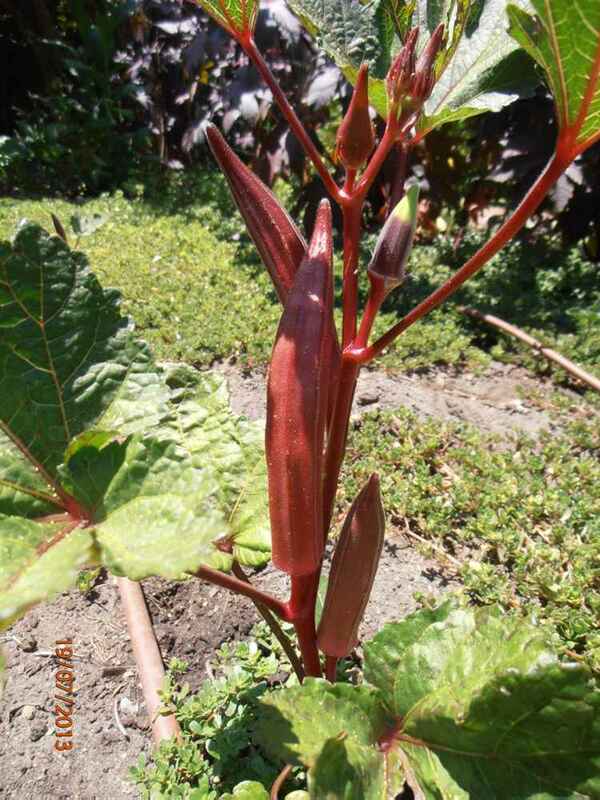 Bright green leaves and pink to red stems, smooth and hairless. One of the best for microgreens and baby leaf greens. Special colorful blend of old-fashioned open-pollinated varieties. Includes whites, reds, purples, and pinks, round or oblong, small and large. Pink 2" radishes, mild and crisp. Great keeper—lasts up to a month if refrigerated. Beautiful round bright pink radishes with crisp white flesh that resists pithiness. Good flavor, a great variety for farmer's markets. Round purple roots, white interior. Crisp, mild, resists pithiness. Unusual color for market gardens. 60 days. Large, round 3 - 4" roots with pure black skin and firm, juicy white flesh. Strong flavored, hardy, stores well. Pre 1885 variety. My favorite. Large round white radishes blushed green outside, deep magenta-red inside. Slices look just like slices of a mini-watermelon! Crisp, spicy flavor, best picked at 1 - 2", though they can reach tennis-ball size. Our favorite radish. Snow white round radishes known for their sweet mild flavor, said to be one of the best tasting. Fast growing heirloom, great for farmer's markets. (=Sparkler White Tip) A very early, handsome French radish grown in Europe since the 1880's. Roots are round, slightly flattened, a lovely deep rose-crimson above, with pure white tips. The pleasing color contrast and earliness made this the favored variety of Parisian market gardeners at the turn of the century.